The voters have punished the Union and SPD at the Landtag election in Hesse on Sunday, 29th of October 2018. The Greens increase, the AfD makes it into the Landtag (state parliament). Black-green can continue to govern with a thin majority. However, the two-party alliance would have only one seat more than the opposition in the state parliament. Other constellations are still possible. In the state election in Hesse CDU and SPD lost dramatically in votes. Beneficiaries are once again the Greens, who were able to collect the best election results in their history in Hesse. Left and FDP made it clear into the state legislature. The AfD could more than double its election result. Despite the huge losses, the CDU on Sunday was clearly with 27.0 percent of the votes the strongest force. The SPD plunged to 19.8 percent and is thus on a par with the Greens, which also increased to 19.8 percent. The AfD moved with 13.1 percent for the first time in the Hessian state parliament and henceforth represented in all 16 state parliaments. The FDP came to 7.5 percent, the Left to 6.3 percent. The Hessian state parliament will have in the future, because of numerous overhang and balancing mandates, 137 delegates. So far it was 110. The CDU has in the future 40 seats, the previous coalition partner Greens and the SPD 29 seats each. The AfD reaches 19 seats, the FDP 11, the Left 9. Thus, the CDU and Greens would come up with the necessary majority in order to continue their alliance. Volker Bouffier (CDU) announced talks with all parties except Left and AfD about a government coalition. He had recently revealed open for Jamaica alliance, the Greens were more reserved, the Liberals advertised openly. Green and FDP in Hesse, however, have among other things, in energy policy and organic farming differences. 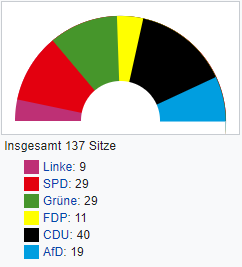 In addition to the previous black-green state government in Hesse, according to the preliminary official final result, three more coalitions arithmetically are possible. While the CDU and the Greens are only able to achieve a slim lead of 69 to 68 seats in the future Hessian state parliament, a Jamaican coalition of CDU, Greens and FDP would have a comfortable majority of 80 out of 137 seats. Also possible would be a grand coalition of CDU and SPD, which would also put the black-green alliance to 69 mandates. Even a government without the CDU is theoretically possible if the SPD, Greens and FDP would merge into a traffic light coalition. They also comprise 69 members. The parties have no time pressure to forge a government alliance. The electoral term of the previous state parliament ends on 17th of January 2019, one day later, according to the state constitution, the new state parliament meets for its first meeting. Usually, the deputies then vote for the Minister President. If they are unable to do so because of the lack of majorities, the previous state government will continue “the day-to-day business”, as determined by the constitution. The government would consequently only executive in office. The elections in Hesse also had an enormous significance for the federal state. At the federal level, the party leaders of the CDU and SPD, Chancellor Angela Merkel and Andrea Nahles, come under pressure after the second election defeat within two weeks. It is rumbling in both parties. Researchers were responsible for the collapse of the CDU and SPD, above all, national political reasons. According to an analysis by the Election Research Group, local parties were unable to convince them of any political, top-level or technical skills. According to Infratest dimap, the CDU lost many votes, especially to the previous Green coalition partners. Frankfurt has turned green in the Landtag elections. The Greens come to 26.1 percent and are thus the strongest force in the city. The CDU achieves 22.8 percent. The SPD is with 18.4 percent in third place. The Left gets 10.5 percent of the votes, the FDP 8.1 percent and the AfD 9 percent.